Big Timber Lodge is an experience you do not want to miss! 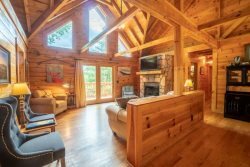 Big Timber is ideally located just south of Helen, Ga. in beautiful mountain surroundings on an idyllic private mountain lake. Whether you want to relax in privacy on the front or back covered porches or have fun swimming, canoeing, or fishing on the private lake, Big Timber has so much to offer! For fall & winter time guests, on those cold evenings, relax in front of the large two-story stone fireplace, pop some popcorn, and watch a movie or sip on your favorite wine from one of our local wineries as you gaze into the firelight. Enjoy preparing food in the well-equipped kitchen for friends and family. Or for that afternoon nap or a good night’s sleep, you can find seclusion in your private 1st floor master suite and bath with jetted tub. There is more than enough room for your friends and family in this grand lodge! This spacious 2 story home has an overhanging loft and ample enough room for up to twenty people to sleep comfortably. The lodge has 4 bedrooms and 3 1/2 bathrooms and plenty of bunk beds on the terrace level. You are going to love the fully finished terrace level with a full-size pool table and additional family room with a bar and fireplace to kick back and cheer on your favorite team on the 2 large HD TVs. After you've explored inside Big Timber, step outside and look at all the possibilities for fun and relaxation. Relax in the large 7 person hot tub under the stars and watch the outdoor TV. Or how about roasting marshmallows by the fire pit? You may even decide to walk down Big Timber Trail to the small private community lake and enjoy your own private dock and supplied canoes for fishing and boating. The cabin was not only esthetically beautiful, it was so comfortable. You can clearly see that a lot of love was put into working on this cabin. We felt the love upon our entrance. Everything was provided. Want to go back! Felt like homw. I had wonderful service when calling the office on the phone. This is important to me as I am in Tampa and relying on the people at the office to be of assistance. I also was impressed with Jayne's service when we arrived at the office to check in. She was warm, pleasant and very helpful. Can't ask for better. We come back every year to Big Timber Lodge because it has everything we look for in a gathering place for our family. The accomodations are always inviting and meet all our needs. We love the fire pit and it's location to the Lodge. The kitchen has everything we could ask for. Nice touch on the Wine cooler. Glad to see corn hole game added. Saves us bringing one of ours. We enjoy the small electric fireplaces. It warms up the rooms in the mornings very nicely. Great time. TV did have lines through the picture per husband.